All Photographs by Edmund Sumner Photographer / Sumner Partnership Ltd. This adventurous new house in Sri Lanka intelligently and dramatically exploits its stunning clifftop setting. 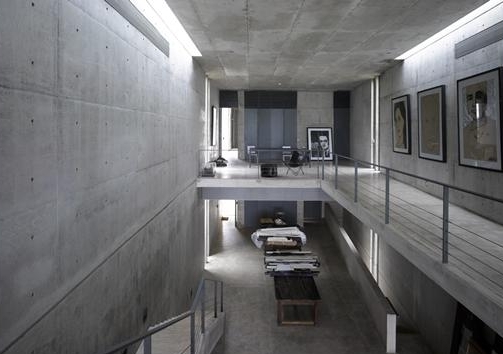 Recent works by Japanese architect Tadao Ando featured in the AR showed something of a departure from his signature use of exposed concrete, with two projects of irregular form, cloaked in sheet steel (AR November 2005 and August 2007). Designed concurrently but finished a number of years later, this project for a house in Sri Lanka returns to a more familiar language of pristine exposed concrete, arranged to contain a series of protected courtyards and voids. In an urban setting Ando would typically build a wall around the site to control and bring distinction to the relationship of inner and outer realms, using tension between found and imposed geometries to create dynamically lit spaces. On this site, however, fewer constraints existed so the architect was free to compose a form that responded to key views and aspects of orientation. Remarkably, Ando never visited the site before construction and has not been there since its completion. 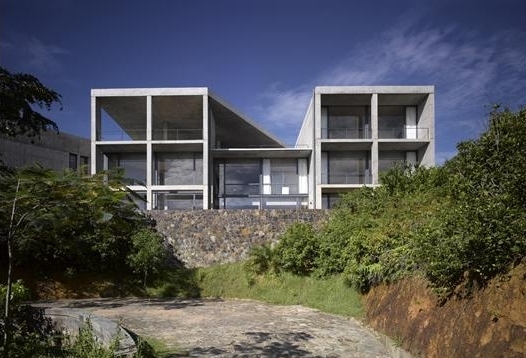 He relied instead on the coordination skills of two long-term Japanese collaborators, Kiyoshi Aoki and Yukio Tanaka, who liaised with local firm PWA Architects. Ando describes his envoys as being of ‘around retirement age’, but ‘still fit’ and ‘wanting to put their experience to good use’. They teamed up with PWA founder Philip Weeraratne and his associate Ravindu Karunanayake, to ensure Ando’s exacting standards were maintained, while also, according to Weeraratne, ‘developing a partiality for Sri Lankan curry’. Checking progress and enjoying local cuisine, they made many trips to the remote coastal site. Described as one of the country’s most spectacular places, it perches on cliffs above Mirrisa Beach on the southern tip of Sri Lanka, with panoramic views of the Indian Ocean. The site was acquired by Belgian entrepreneur Pierre Pringiers, who came to Sri Lanka as a traveller, on which he got work in a local factory. After a while, he started his own factory, manufacturing solid rubber tyres. The fruits of his enterprise are clear to see in the scale and quality of this home. But he is also known to be generous with his wealth and time. Described by Weeraratne as a philanthropist, he has made a significant contribution to the local economy by leading the post-Asian tsunami recovery initiative in 2004. He has launched programmes such as the Building a Future Foundation, which develops the practical skills of local workers, training them in boat-building crafts for tourism and fishing-related activities. 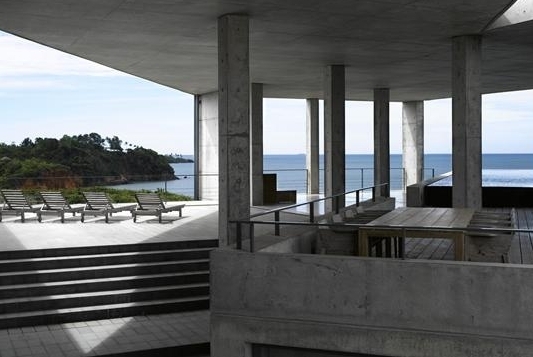 The house was a gift to his wife Saskia Pintelon, a respected artist, who chose Ando as her preferred architect shortly before the natural disaster struck. The impact of the Asian tsunami and the subsequent civil unrest is thought to account for Ando’s reluctance to visit the country.Instead, Weeraratne and his team, including representatives from the concrete subcontractor, who had to produce mock-ups before being awarded the contract, all travelled to Japan to experience Ando’s work. After this meeting, the Japanese office issued a simple set of drawings, before the Sri Lankan team set about producing nearly all the detailed drawings for construction. Accommodation is arranged into three wings that lock into a central courtyard and a grand stair. Rising up to the piano nobile, to the left of the stair is a bedroom wing. To the right, at 90° is the studio and gallery wing that tapers as it extends into the surrounding landscape. And cutting across, at 45° is a lower two-storey wing, which contains a double-height living and dining room, complete with rooftop swimming pool and cantilevered terrace, which looks back over the stair. In the knuckle between the studio and the living rooms is a service core that holds the kitchen and ancillary spaces. This area includes a master suite on the upper level and a service entrance that separates the artist’s studio from the domestic quarters that occupy the ground floor. The studio is described by Weeraratne as the grandest of all spaces, being the most ‘characteristic of Ando’s use of light on plane’. 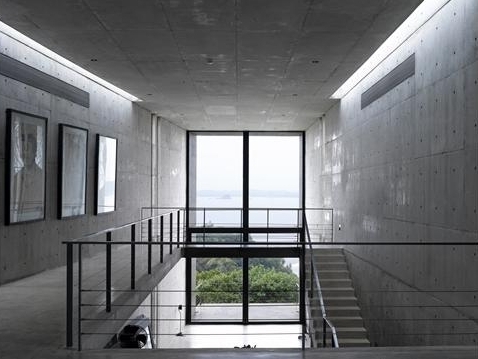 He could not avoid mentioning the gadget, which takes the form of the 6m x 6m window at the end of the dining room that smoothly drops down into the basement void below to open up the interiors to one of Ando’s framed views. Weeraratne applauds Ando’s ability to capture the scenery so well, stating that ‘what amazed me most was what a true master Ando was. He had not even visited the site, yet was able to be so precise with positioning views. That is the evidence of years of practice.’ Taking a more objective stance, however, you may ask, precisely how accurate do you need to be when working with such a stunning panorama. Nevertheless, Weeraratne’s respect for his master is palpable,and the experience has been rewarding for all. When asked if this project has influenced later work, he concedes that ‘not everyone can afford to spend five times the normal price on a home, but what this process has given us is a proven reputation for being able to produce high-quality work’. Great site. Lots of helpful information here. I’m sending it to several pals ans also sharing in delicious. And of course, thanks to your effort!